Petone is a small town, now a suburb of Lower Hutt, and is located across the harbour from Wellington City metropolitan area. 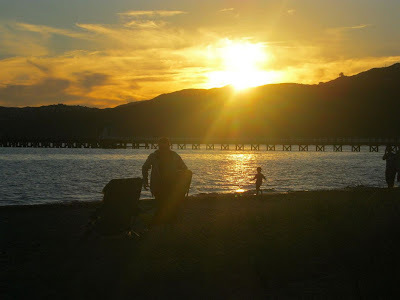 During our recent holiday in Wellington we stayed in a motel in Petone, just beside the Petone Beach. In this photo the sun is setting over the western hills surrounding the harbour, and in the gloam you can see the outline of the Petone Wharf, now rarely used by ships and mostly used by recreational fishermen. There used to be an abattoir in Petone and the wharf may once have been used to load meat aboard ships for export, or distribution around the New Zealand coast. I don't really know its history. Click picture to enlarge. I like a sunset :) and I like you photo. nice photo.. the sunset capture so beautiful..
Nice pic. Every sunset gives one day for hope. Dave, I have had you and your family in my thoughts in this time of tragedy in NZ. I can only hope that you and your loved ones are uneffectd by the devastating earthquakes in Christchurch. What a beautiful city shattered and such sad loss of life. I have wonderful memories of Christchurch some 6 years ago where my husband and I honeymooned and feel saddened by the shocks of the quakes over the past 5 months.